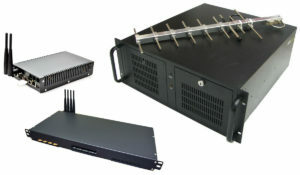 Minimal configuration of SIM-server based system includes at least one SIM-bank and one Gateway. SIM-banks are special devices for holding hundreds of SIM-cards. Gateway is any compatible GSM-device including VoIP-GSM gateways, SMS-gateways etc. Placing SIM-cards in a SIM-bank makes them available for remote allocation. It means any SIM-card can be allocated to any Gateway specified in SIM-server software. All tools for managing GSM-devices, setting up SIM-server operation mode and tuning SIM-card allocation rules are available via Web-interface. Scalable SIM-server architecture allows adding dozens of SIM-banks and Gateways easily to single deployed copy of the software. Geographical location of SIM-bank devices and Gateway devices is not important for system to work. Devices may share the same room either stay in different countries. The only condition is a common address space supporting TCP/IP protocol for all devices as well as for server with “SIM-server” deployment. Examples of such address spaces include the Internet, local networks, VPN, etc. Allocating remote SIM-card to Gateway’s channel is performed either automatically, either by issuing an API-command.